Never heard of the Transit Village? See Transit Village 101. 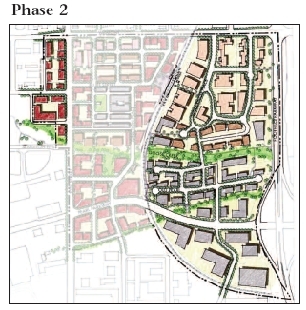 On Tuesday night (March 2, 2010), the Boulder City Council provided direction for initial implementation and funding for the Transit Village Area Plan (TVAP). David Driskell, Executive Director of Community Planning & Sustainability, presented an overview of plans for the Transit Village that includes two phases of development and a search for a new name. Phase 1 includes 1200 dwelling units and 1000-1600 jobs. The Phase 1 area extends west of the train tracks to 30th St., and from Valmont Rd. to the North Boulder and Farmers ditch south of Pearl Parkway. Phase 2 anticipates 800 dwelling units and 2600 jobs and includes the area east of the tracks to Foothills Parkway bounded by Valmont to the North and the railroad tracks to the South. Council has discussed revisiting the uses at the City site and staff recommends revisiting them in a couple of years. The City has received a pre-application for the Sutherlands site that includes a good mix of uses. This site has a challenging connections plan, includes the train platform, and will have mixed use development, possibly with a hotel. The Transit Village site includes a pocket park near the Depot, an ambitious public art program (42 proposals have been received from artists), an aggressive stormwater plan, and the Access District. 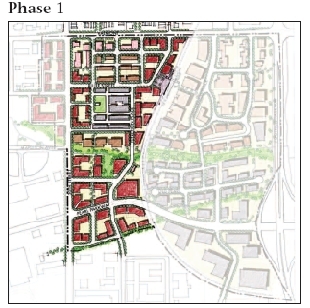 On Thursday March 4, Planning Board considered a concept plan for Junction Place Village, a mixed-use development with 300 apartments and 11,000 square feet of non-residential floor area on 5.02 acres located south of Pearl Parkway and the future Junction Place. One of the more interesting discussions related to renaming the Transit Village. Staff provided a list of alternative names, and asked Council members to vote on their favorites. Suggestions include Boulder Junction, East Boulder Village (EBo), Boulder Commons, Goose Creek (Greens/Central/District/Commons), Goose Creek Junction, Depot Square, Depot Commons, Depot East, Depot Junction, Boulder Junction Ara, Boulder Wye, East and Boulder Ara (EBA). The terms Ara and Wye are historic names (pointed out by resident Kurt Nordback and historian Silvia Pettem) for the original train stop that was established in 1873 on almost exactly the same spot as now occupied by the Boulder Jaycees Depot. Five property owners/developers testified, and all but one said they support moving forward with the plan. They cited the time and money investments already put into redevelopment plans, and John Pawlowski called it a “good idea, good concept, and good vision.” Owners like the flexibility of the plan, and expressed some concern about connections, getting the parking component right, and funding for the required infrastructure. A minority opinion was voiced by Roy Young, a small business owner of a Phase 2 property, who suggested that the connectivity plan means paving, creating more streets, and a car-friendly place rather than a really pedestrian friendly place. Andy Bush and Bob Sutherland were strongly supportive the plan, believing it will create something really exciting and stimulate economic activity in an area of the city that is waning. Lisa Morzel offered a motion (seconded by Crystal Gray) to direct the interdepartmental staff team to move forward on implementation tasks as described and discussed at the January 2010 Joint Study Session and listed in Attachment A of the staff memo. In arguing for the motion, Lisa Morzel said, “Property owners have participated in good faith. Now is the time to let this move forward.” Of the supporters, K.C. Becker, George Karakehian, Ken Wilson, Macon Cowles, and Suzy Ageton expressed some reservations, mainly about the connection plans, but supported it largely because the property owners support it and because it has staging and flexibility that will allow the plan to evolve as it develops. Matt Appelbaum opposed the motion, saying he “doesn’t see enormous benefit” in a plan that is huge for the City and is the linchpin of east Boulder redevelopment. He fears that approving this now might lock in some developments that will be regretted later, especially if plans for the Pollard site change, and he does not believe this plan is good for market rate affordable housing. The motion passed 8-1 with Matt Appelbaum opposed.